North America Sheet VII Pennsylvania, New Jersey, Maryland, Delaware, Columbia and Part of Virginia. 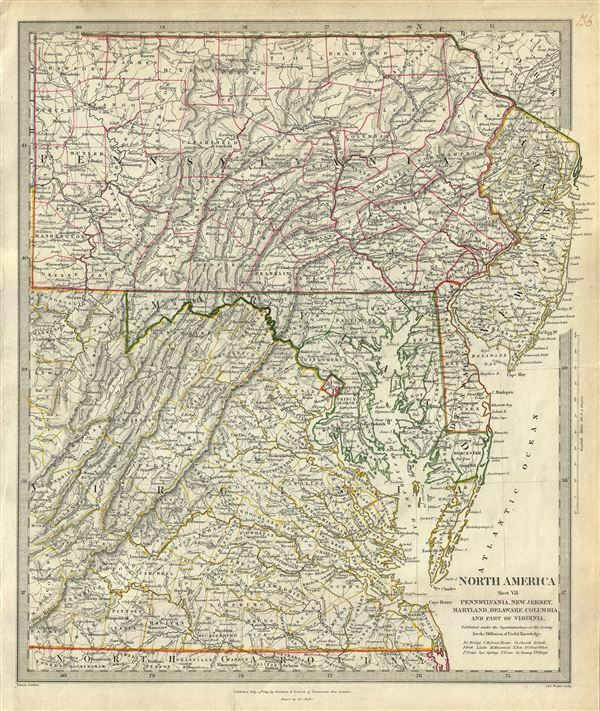 This is a lovely 1833 map of Pennsylvania, New Jersey, Maryland, Delaware and Virginia issued by the S.D.U.K. The map covers the states of Pennsylvania, New Jersey, Maryland and Delaware in full with parts of modern day Virginia and West Virginia. States are color coded with outline color, and include the District of Columbia. Several important topographical features including rivers, mountains, lakes, etc. are noted throughout. Published in 1833 by Baldwin and Cradock of Paternoster Row for the Society for the Diffusion of Useful Knowledge, or S.D.U.K. Although the Society formally closed its doors in 1848, subsequent reissues of the S.D.U.K. atlas were printed well into the 1870s by Chapman and Hall, who acquired the original plates. Maps of the Society for the Diffusion of Useful Knowledge, (London: Baldwin & Cradock), 1833. Rumsey 0890.134. Phillips (Atlases) 794.